Do you have a copy of the DSM-5? (The Diagnostic and Statistical Manual of Mental Disorders). - Ask Us! Q. Do you have a copy of the DSM-5? (The Diagnostic and Statistical Manual of Mental Disorders). Online access is available through the Psychiatry Online database. Off-campus use of the electronic version is limited to current MTSU students, faculty, and staff only. Alumni or visitors wishing to consult this resource must visit the library in person. For access to the print version, visit the Reference area on the 1st floor of the library. The call number for the DSM-5 is 616.89 Am32d 2013. The print DSM-5 can be used in the library only. 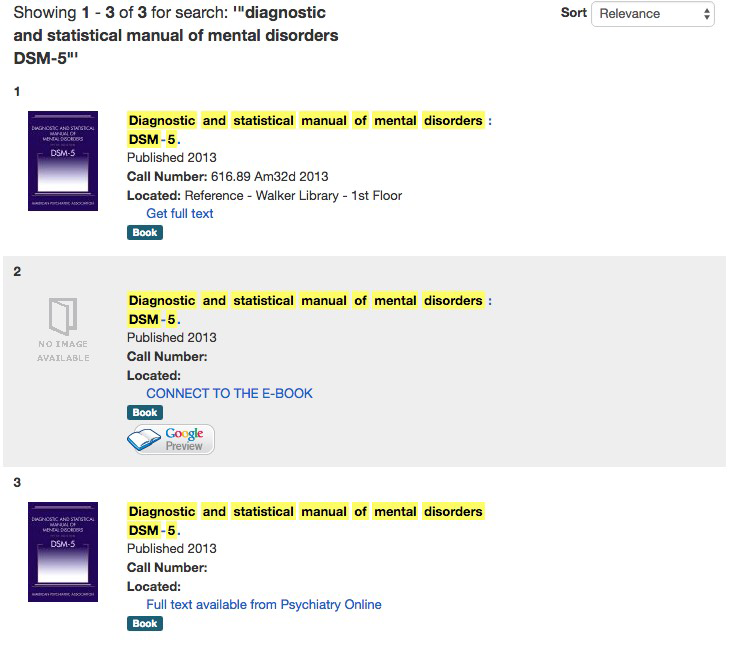 Below is an image of the results from searching "diagnostic and statistical manual of mental disorders DSM 5" in the Library Catalog. Note: Older editions of the DMS can also be found online or through the Library Catalog.